Please join us on 19 April for the first ever Emirati Day! Join us on Friday 19 April for our first ever Emirati Day! The special day will be packed with lively Instagrammable parades, fun family rides and roller-coasters, an abundance of food experiences, and opportunities to meet your favourite animated Hollywood characters like Kung-Fu Panda, Shrek, the Smurfs, and the cast of Madagascar. Plus an amazing concert by Balqees Fathi, performing in front of the beautiful Raj Mahal theatre located at BOLLYWOOD PARKS™ Dubai. 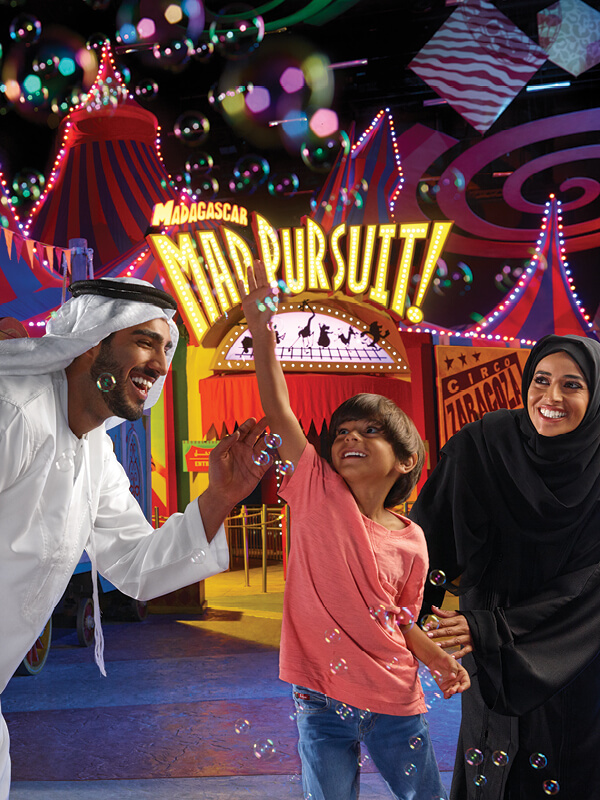 Spend an awesome day at MOTIONGATE™ Dubai, Bollywood Parks™ Dubai and LEGOLAND® Dubai and experience amazing. Plus an amazing concert by Balqees Fathi, performing in front of the beautiful Raj Mahal theatre. These Terms and Conditions apply to the online sale of Tickets to Dubai Parks and Resorts (“DPR”) theme park(s). This offer is for UAE NATIONALS ONLY. At the Gate all guests will be required to present a valid Emirates ID Driving License or Copy of valid UAE Passport. The guest must enter via the turnstile and scan ticket(s) at park gate to gain entry. Unless otherwise stated, Tickets are only valid for the theme park(s) detailed on the Ticket and are not valid for separately ticketed events, performances or activities at that theme park, other theme parks or elsewhere within Dubai Parks and Resorts. This ticket is upgradeable to an Emirati Annual Pass, a regular Annual Pass (Single Park and Multi-park). Guests must visit the park’s guest services desk for an upgrade on the date of visit. Please note: expired tickets cannot be upgraded. Tickets are non-refundable, non-resalable and non-exchangeable for any other promotion, discount or ticket. This ticket is valid for entry on Friday 19th April, 2019 for MOTIONGATE™ Dubai, Bollywood Parks™ Dubai and LEGOLAND® Dubai. The ticket includes access to the concert at BOLLYWOOD PARKS™ Dubai. For re-entry Guests are requested to present their physical ticket. Children under the age of 3 enter for free. Valid ID proof is needed. This offer is valid for new reservations and is subject to availability. Each Ticket holder will be issued with his/her own E-Ticket that can be used at the turnstile for entry. A Ticket purchaser may purchase Tickets only for his/her own personal use and/or that of his/her Guest(s). DPR and the relevant park, in their absolute discretion, reserve the right to vary the opening and closing dates and times of the attractions and to close, remove or cancel all or any part of the rides, events or facilities within the attractions for any reason including, but not being limited to technical, health and safety and/or operational reasons or due to special events or private functions. For the avoidance of doubt, the full value or any part of the value of the Ticket will not be refunded nor will any compensation be payable if any of attractions are removed or closed during the year. Height, weight, size and age restrictions and medical warnings apply to certain rides and attractions. These will be displayed at each relevant ride and attraction and made available from Guest Services. The authorized holder of the Ticket must present the Ticket upon entering the park(s). All persons entering the park(s) are subject to the rules and regulations of entry as displayed at each park’s main entrance, at Guest Services and as otherwise made available by DPR. Dubai Parks and Resorts management reserves the right to change any part of the promotion at any time without notice. For the up to date information on the official opening of the parks please visit the relevant park’s website. Outside food is not permitted in the Park. All bags, backpacks or packages may be inspected prior to entering the Park. By purchasing this ticket, the guest agrees that DPR can communicate with the guest via email and/or mobile SMS with latest information and special offers. Parking is free within the Dubai Parks and Resorts P1 and P2 Car Park. Valet Parking is priced at AED 100 per visit. All parking is subject to availability. 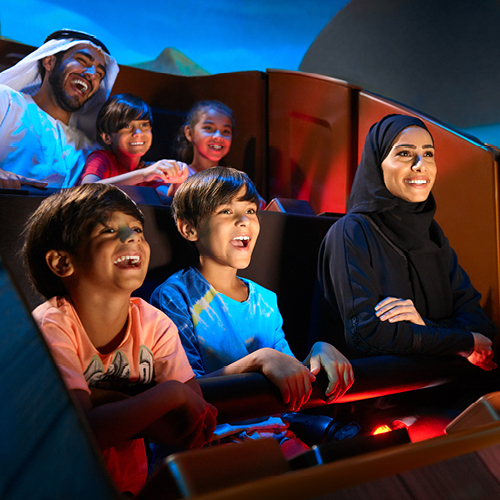 For Ticket related questions please visit the FAQ page on our website, email amazingservice@dubaiparksandresorts.com or call UAE: 800 AMAZING (2629464) | International: +971 4 820 0000. The full version of these Terms and Conditions can be found on our website. You can't buy more than 15 tickets at once. You need to add at least 1 ticket.